Have you ever wondered if bringing your kids to see live theatre is a good choice? What if they are too wiggly or too chatty? Do we have to dress up in nice clothes? Will the price be worth it? These were our concerns as we walked into the Nashville Children's Theatre last week. 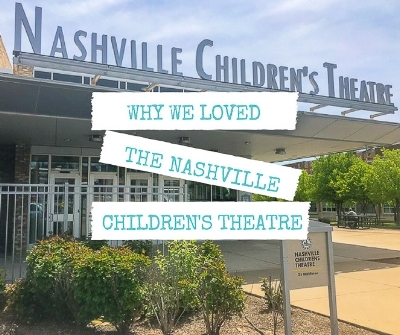 Never fear; the Nashville Children’s Theatre is totally worth it and so kid friendly! Your worries will float away as you walk in the door. Hungry for a little fun? Nashville Children’s Theatre has cooked up a tasty treat, closing its season with the delightful “Dragons Love Tacos." NCT Executive Artistic Director Ernie Nolan adapted the piece from Adam Rubin and Daniel Salmieri’s New York Times bestseller, which reminds us that while dragon taco parties can be great fun, serving spicy salsa can have “fiery” consequences. Nashville Children's Theatre's final show of the season, Dragons Love Tacos, premiered last night to a delighted audience. The energy was infectious led by James Rudolph, in a sequined purple suit you have to see to believe. Lots of fun new additions on the horizon at the oldest professional children's theater in the country! Nashville Children’s Theatre (NCT) moves into the future with a new look. Marking its most dramatic visual identity change since 1986, NCT unveils a new logo and a new brand. With its vision focused squarely on the future, Nashville Children's Theatre (NCT) - the nation's oldest professional theater for young audiences - last night revealed its upcoming "Season of Discovery," a slate of six challenging productions, along with an updated rendering of the company's iconic dragon logo. Poignant and compelling, Mockingbird - the play adapted for the stage by Julie Jensenfrom the National Book Award-winning novel for younger audiences by Katherine Erskine - is a remarkably timely and prescient look at the aftermath of a school shooting for the people most intimately affected by it, in particular an 11-year-old girl named Caitlin, who has Asperger's syndrome, and whose beloved older brother was a victim of the horrific incident that takes place (mercifully, for audiences) prior to the start of the play. NASHVILLE, Tenn. — As families continue to cope after recent school shootings in Florida and Kentucky, the Nashville Children’s Theatre has a new play that is helping midstate families with the healing process. Broadway star and two-time Tony Award nominee Laura Osnes will headline Nashville Children's Theatre's Grand Night benefit, set for Saturday, April 14. Chaired by Jamie Eskind, NCT's Grand Night will take on a decidedly theatrical ambience - in "Grand Hollywood style" - showcasing the talents of Osnes, Broadway's Cinderella, while guests enjoy gourmet hors d'oeuvres, fine wines and a multi-course dinner served on the main stage, along with dancing to the music of the Blue Tones late into the evening in NCT's Copeland Studio. Dress for the evening is described as an intriguing blend of "festive chic" and "Hollywood glamour." Nashville Children's Theatre, the nation's oldest professional theatre for young audiences will perform Mockingbird from March 1-18. Based on the award-winning book, Mockingbird provides a look at how a parent and his daughter with Asperger's syndrome cope with a tragic loss due to a school shooting. What perfect timing! Kudos to Nashville Children's Theatre executive artistic director Ernie Nolan and education director Alicia Lark Fuss (who does double duty as director of the play) for their impeccable midwinter choice of A Snowy Day as the venerable company's first show of 2018. 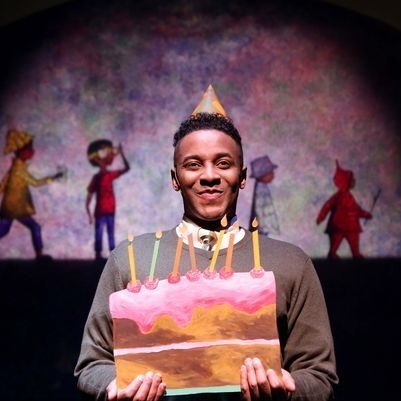 That they had frigid temperatures and snowy conditions to herald the opening of A Snowy Day, playwright Jerome Hairston's adaptation of four stories by Caldecott winner Ezra Jack Keats, was indeed serendipitous, lending some of Mother Nature's authenticity to the show's launch. A world of whimsy is center stage with NCT’s delightful production of The Snowy Day & Other Stories by Ezra Jack Keats. Directed by Alicia Lark Fuss, this theatrical adventure comprises four of Keats’ children’s stories — the groundbreaking Caldecott-winning The Snowy Day, Whistle for Willie, Goggles!, and A Letter to Amy. Ernie Nolan, executive artistic director of Nashville Children's Theatre, and Norma Luther, who took over ownership of Chaffin's Barn Dinner Theatre and spearheaded its renaissance in 2017, last night claimed top honors as "Theaterati of the Year" at Midwinter's First Night at Music Valley Event Center. My children and I have been fans of the Ezra Jack Keats classic, The Snowy Day, for as long as I can remember. When I heard that it was going to be brought to life on the Nashville Children’s Theatre stage, I couldn’t have been more excited! What I didn’t expect, was to be introduced to three additional stories by the renowned children’s book author and illustrator during the show. What a welcomed surprise! The sun was shining brightly last Friday as children settled in to enjoy Nashville Children’s Theatre’s charming production of “The Snowy Day & Other Stories.” It seems that even after a week of freezing temperatures and icy conditions, there’s still something pretty magical about a new-fallen snow — especially when seen through the eyes of a child. Winners have been announced for the 2017 BroadwayWorld Nashville Awards, honoring productions which opened between October 2016 and September 2017. This year the BroadwayWorld Regional Awards took place in a record number of markets, with a record number of votes - including 56 cities across the United States; with our awards taking place globally in a record-breaking 11 countries, including multiple Canadian cities! Design categories, road shows, theatrical events and the 12 people whose achievements in 2017 are particularly noteworthy were revealed tonight as part two of First Night's Top Ten of 2018 - critic Jeffrey Ellis' annual review of the best in Tennessee theater - was presented during a live Facebook broadcast with two of the hosts of Midwinter's First Night (Ashley Wolfe and J. Robert Lindsay) announcing the work recognized among the best of 2017. NCT nominations include Ernie Nolan, executive artistic director, Nashville Children's Theatre (for Theaterati of the Year), Bill Rios' lighting design for THE HUNDRED DRESSES; Patricia Taber's costume designs for THE HUNDRED DRESSES and MR. POPPER'S PENGUINS; Mitch Massaro's scenery design for THE HUNDRED DRESSES, and Scott Leathers' scenery design for MR. POPPER'S PENGUINS. First Night's Top Ten for 2018 - critic Jeffrey Ellis' annual review of the best in Tennessee theater - were revealed last night during a live Facebook broadcast, with the hosts of Midwinter's First Night (Ashley Wolfe, J. Robert Lindsay, Tosha Pendergrast and Ben Pendergrast) announcing the productions and performances recognized among the best of 2017. 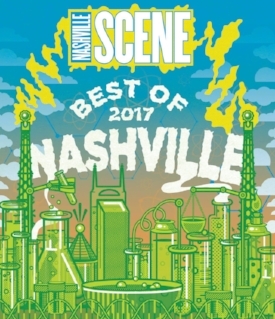 Nashville Children's Theatre's season opening production of THE HUNDRED DRESSES is nominated for BEST PLAY, BEST DIRECTOR (Ernie Nolan), and BEST ACTOR (Barry Scott). 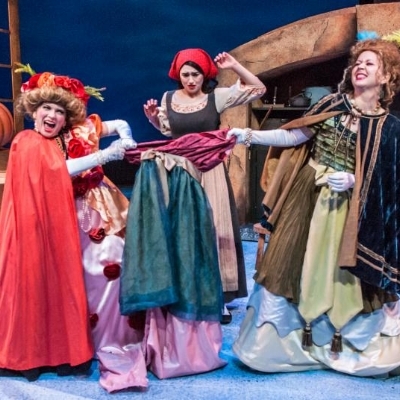 ‘Tis the season for holiday offerings in our local theater community, and Nashville Children’s Theatre (NCT) is in the merry mix with its return of Cinderella. This is the third year for NCT presenting the late Scot Copeland’s unique adaptation of the beloved timeless fairy tale. If you haven’t yet experienced it, you’re probably wondering what the Cinderella story has to do with the holidays. Copeland’s adaptation sets the story around Christmastime, and kids will love the magic of the falling snow on the stage. Nashville Children’s Theatre agrees. That’s why they’ve not only chosen to punctuate the season with one of the greatest love stories of all time, but they also suggest that it could become so much more—your new holiday tradition. This is very exciting, because holiday traditions, like mistletoe, are filled with expectation! Adapted by former artistic director Scot Copeland (who passed away in 2016), NCT’s staging offers a fresh take on the beloved tale, setting the piece in late 19th-century Austria, a period ideally suited to the story’s grand fashions, music and romance. For both mainstream theatres and theatres for young audiences (TYA), the December holidays are a time to engage with classic stories, holiday-themed or otherwise. “Grown-up” theatre offerings this season include Shakespeare in Love and Lauren Gunderson’s Pride and Prejudice sequel Miss Bennet: Christmas at Pemberley, and theatres for young audiences are offering a range of takes on well-known titles as well. From faithful revivals to fresh adaptations to the retelling of local histories, TYA companies are programming shows that resonate both with the adults who know the material well and the kids who’ll be encountering it for the first time. Nashville Children's Theatre (NCT), the nation's oldest professional theatre for young audiences announces the return of its holiday event Cinderella, in what will be the third and final year NCT has produced this wintertime Cinderella. The production runs December 14-21 at Nashville Children's Theatre. Adapted by the late Scot Copeland, who led NCT for more than 30 years as its producing artistic director, this sparkling holiday confection of Cinderella tells the familiar story of a lonely, mistreated young woman whose life is transformed through magic and love. Audiences will experience the well-known story told differently from popular films in surprising and playful ways. Temperatures may be dropping, but Nashville Children’s Theatre’s charming production of Mr. Popper’s Penguins is guaranteed to warm your heart. Based on the Newberry Award-winning novel by Richard and Florence Atwater, this endearing family musical, with book by Robert Kauzlaric and music/lyrics by George Howe, follows a restless house painter who dreams of leaving his sleepy hometown behind for grand Arctic adventures. But everything changes with the unexpected arrival of a spirited penguin named Captain Cook. Offering a thoroughly delightful and completely entertaining story about welcoming new challenges and living life to its fullest, Mr. Popper's Penguins - the charming musical onstage at Nashville Children's Theatre through December 3 - also offers its young audiences an intriguing history lesson about life during the Great Depression. A purely magical experience awaits your family at NCT during its current run of Mr. Popper’s Penguins. This festive musical is based on the 1938 Newbery Honor children’s novel of the same name by Richard and Florence Atwater. This is the second production under the direction of newly appointed Executive Artistic Director Ernie Nolan. It’s exciting to see that the high bar of sophistication Nolan set with the season’s first production, The Hundred Dresses, goes even higher with Mr. Popper’s Penguins. Mr. Popper’s Penguins waddled into town this week and are performing through December 3, 2017 at the Nashville Children’s Theatre in a not to miss Broadway Musical style show! What do you get when you introduce a daydreaming house painter to a dozen delightful penguins? A flipper-flapping musical tale that will make you believe in the power of ingenuity and determination, according to Nashville Children's Theatre's executive artistic director Ernie Nolan, who describes it as a show "packed with puppetry, humor, and heart, Mr. Popper's Penguins is bound to put a smile on your face." 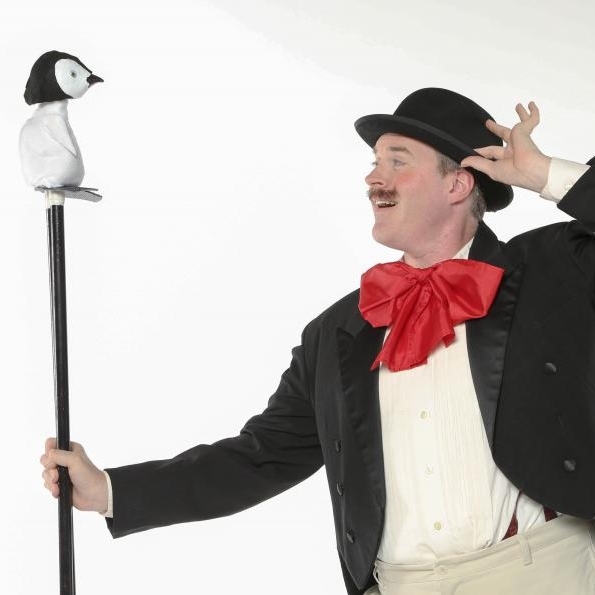 Mr. Popper's Penguins Opens at the Nashville Children's Theatre on October 26 and Runs Through December 3. We chat with puppet designer Brian Hull. Reader Selections: Favorite Arts Education and Favorite Performing Arts! There are literally hundreds of wonderful places to take your kids in greater Nashville! Each year, we survey Nashville parents to find out where they love to take their kids. 2017's results are below. When Ann Bradford Tharp was invited to join the Junior League in 1958, one wore white gloves to the meetings. Also stockings, heels and a good dress, or the then-fashionable Davidow suit, if a member preferred. Tharp's then soon-to-be mother-in-law, Cornelia Keeble Ewing, founded Nashville's Junior League in 1922. NCT celebrates the opening of its 2017-18 season under the leadership of new Artistic Director Ernie Nolan. 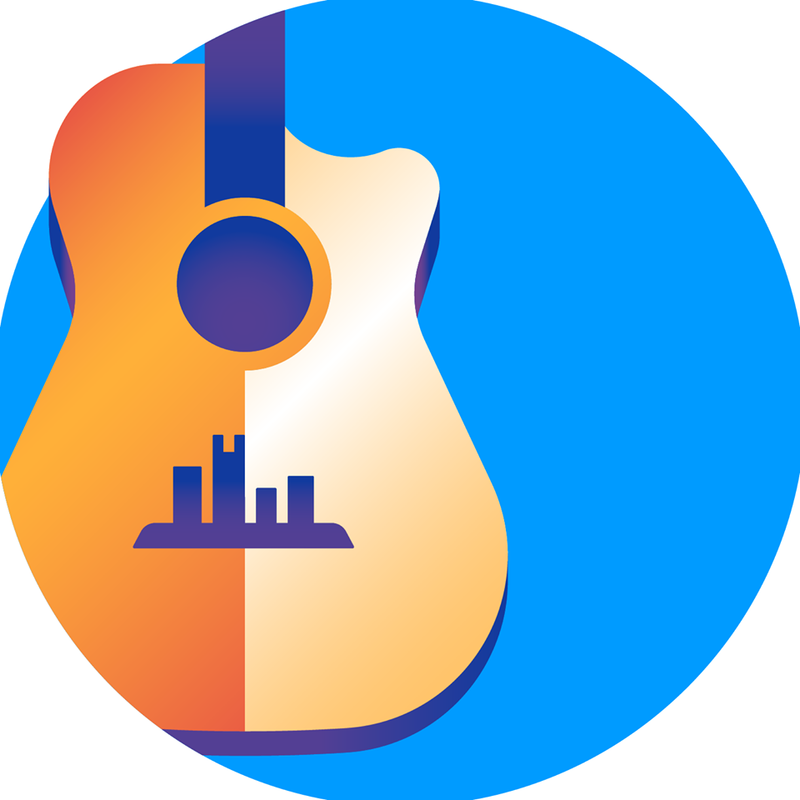 If Nolan’s first production at NCT is an indicator, families in the Nashville community have a lot to look forward to in the coming months and years under his direction. Nolan’s first impressive accomplishment is noticeable before walking into the theater. It comes by way of the fact that PLAYBILL — the monthly U.S. magazine for savvy theater enthusiasts — is now publishing NCT’s program. It’s a fantastic stroke that brings NCT up to a whole new level of sophistication. It’s been nearly 75 years since Eleanor Estes first published “The Hundred Dresses.” But with its themes of empathy and understanding, this children’s classic feels as fresh and relevant as ever. And Nashville Children’s Theatre’s engaging new production offers an especially rewarding way to kick off the company’s 87th season. Ernie Nolan, Nashville Children's Theatre's new executive artistic director, makes an impressive debut with The Hundred Dresses, the initial show of his first official season as the leader of the country's oldest theater for younger audiences. Nolan's predecessor, the late and great Scot Copeland, led NCT through tremendous growth during his tenure and he is, without question, a hard act to follow. 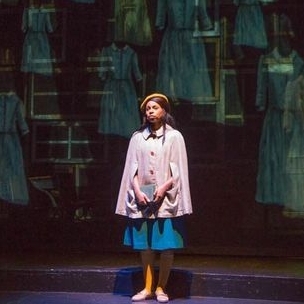 Nashville Children's Theatre's (NCT) 2017-2018 season kicks off with a production of The Hundred Dresses, based on the book by Eleanor Estes. I consider myself fairly well read, but I was not familiar with this classic book. I'm so glad Ernie Nolan, NCT's new Artistic Director, chose this story as his debut production. Focusing on a timely subject matter, The Hundred Dresses led to one of the best conversations I've had with my 7 year old in a long time. At a time when immigration issues and social division continues to dominate headlines, Nashville Children’s Theatre opens its 87th season with a tale of understanding and acceptance. Today, we very proudly shine the spotlight on PSM Daniel Brewer, the dean of production stage managers in this region, and the resident stage manager at Nashville Children's Theatre. 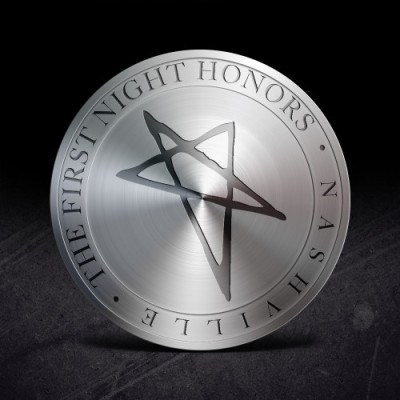 In 2011, he was among that year's First Night Honorees in recognition of his truly exceptional career and for the grace and skill with which he does his job. In fact, we wouldn't be at all surprise to find his headshot next to the very definition of "stage manager" in reference books. Few U.S. children’s picture books written before 1962 depicted Black children with anything resembling humanity, often employing racist caricatures if they featured Black children at all. The United States Postal Service (USPS) honors one illustrated book that rejected that tradition, “The Snowy Day,” with its own stamp line. After a 10 month search, the Nashville Children’s Theatre has named their new Executive Artistic Director, Ernie Nolan. Nashville Children’s Theatre’s delightful fall lineup weaves together a trilogy of stories of hope and transformation. Each play is a reminder to children that we never really know what a person is capable of achieving; that behind what we see each day may be a life quietly transforming itself. Nashville Children's Theatre, the nation's oldest professional theatre for young audiences today announces full casting and creative teams for the 2017-2018 season, opening the theater's 87th season - its first with programming designed by new executive artistic director Ernie Nolan.